Accredited in the industry as one of the outstanding business firms, we are readily indulged in providing top class Variable Speed Pulleys. We bring forth our vast industrial experience and expertise in this business and are engaged in presenting diverse range of Variable Pitch Pulley to our esteemed customers. This product is widely in the various factories to approximate the full motor load with the unit. Furthermore, Variable Pitch Pulley is easy to install. We manufacture high quality variable speed pulley for the application where the speed of the driven equipment is required to change due to sudden changes in load condition or where application are not running at same speed at all times. Our firm brings forward a fine quality gamut of variable pulleys, which can be purchased from us in different sizes. These pulleys are mainly used for converting a constant speed motor into variable speed. This operation can occur accurately and smoothly, even while the machine is in motion. Manufactured using superior grade raw material, these can be obtained from us at market leading prices. Being a quality driven company, we offer our precious clients the premium quality range of Variabal Puliey For Staeter M/c. 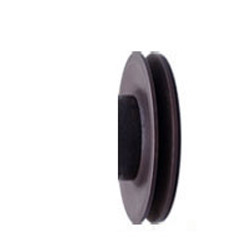 We are involved in offering an extensive variety of Variable Speed Pulley to our patrons. 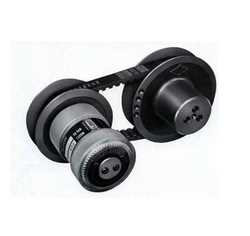 - With marvelous specialization in this domain, we offer a qualitative range of Variable Speed Belt Pulley. Dimensions: 4.24" x 3.14" x 1.08"
Our firm brings forward a fine quality gamut of Variable Pulley, which can be purchased from us in different sizes. These pulleys are mainly used for converting a constant speed motor into variable speed. This operation can occur accurately and smoothly, even while the machine is in motion. Manufactured using superior grade raw material, these can be obtained from us at market leading prices. We offer our clients with a quality range of Variable Speed Pulleys, which is highly acclaimed across the globe. Manufactured with conformation to international standards, these pulleys are easy to handle and ensures high performance.